The We-Ko-Pa experience begins miles from the golf club, where you leave city life behind and emerge into the stunning Sonoran Desert that seems the perfect canvas for world class desert golf courses. Although the Saguaro Course at We-Ko-Pa doesn’t draw the same plaudits as its more illustrious sibling, the Cholla, it is still one of the finest new additions to Arizona’s enviable collection of world class desert golf courses. 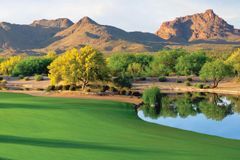 The Saguaro Course is undoubtedly a new jewel in Arizona’s crown and golfers of all abilities can enjoy the challenges it presents thanks to five different tee positions that allow golfers to play the full 9,912 yards right down to a more manageable 5,061 yards for those just getting to grips with golf.